A painter of some repute (ok it was Picasso) once said: good artists copy, great artists steal. If you are an employer branding artist who is working hard to paint the picture of what it’s like to work at your company and are looking for inspiration that you can copy or steal, this post is for you. We went out and gathered some fun and creative examples of what great employer branding can look like -- ranging from catchy recruiting ads and attention-grabbing emails, to LinkedIn Career Pages and videos. The goal of these examples is to show you that there are many creatives ways you can showcase what it’s like to work for your company -- you don’t have to be confined to cheesy stock photos and cliched messaging. Here are 10 examples, but you can see all of them in our eBook, 25 Inspirational Recruitment Marketing Examples. 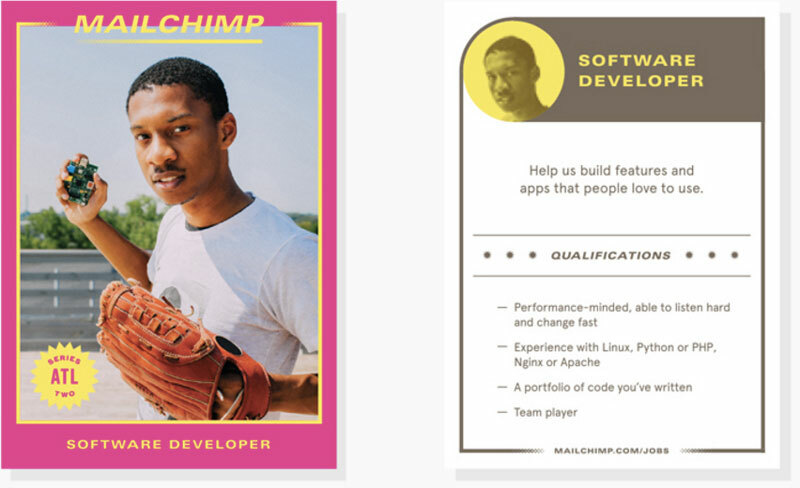 Mailchimp didn’t settle for just any good old recruitment ads -- they designed theirs as baseball cards. By handing these nifty cards out at recruitment fairs, the company found an unusual and memorable way to grab the attention of highly sought-after tech talent. Unlike a hefty brochure, the cards were quick and easy to read, conveying just enough information to get candidates interested before talking to a recruiter. And they’re the perfect size to slip into your pocket and read again later. Imagine Learning didn’t want anyone to miss their recruitment efforts. 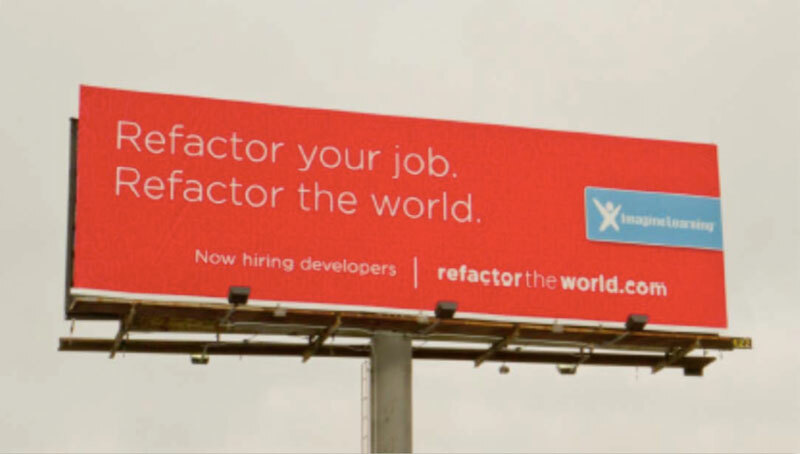 That’s why they created an eye-catching billboard to advertise their job openings, allowing them to target candidates on their commute. With a website that reflected this wording in it’s URL, the memorable headline made it easy for candidates to look up the site later to apply. Culture is front and center on the careers page for TINYpulse. The company immediately paints a picture of itself as an exuberant place to work, with an amusing staff picture and a description that highlights unusual perks, like adorable dogs running around the office. 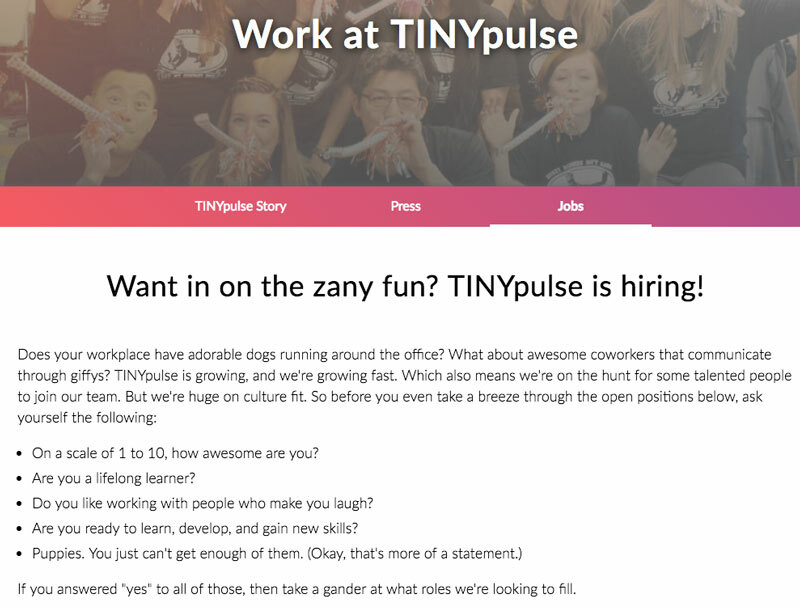 What’s more, in place of a standard description of the type of person they’re looking for, TINYpulse uses their list of applicant requirements to continue the fun. The opening question asks candidates to rank how awesome they are. The points that follow delve deeper into the attributes they’re looking for, before ending with a note about puppies that’s guaranteed to make dog lovers smile. The page also wisely includes a link to the company’s Instagram, where candidates can discover more about the workplace culture. When applicants visit the careers page for AppDynamics, they’re greeted with an inspirational “be an AppDynamo” video. This video allows them learn what AppDynamic is all about directly from the company’s founder and chairman. Short, easy to absorb, and inspirational, the video is hosted on YouTube, allowing AppDynamics to reach even more potential candidates who might not have thought to visit their site directly. United Shore puts their company culture at the forefront of their recruitment efforts. 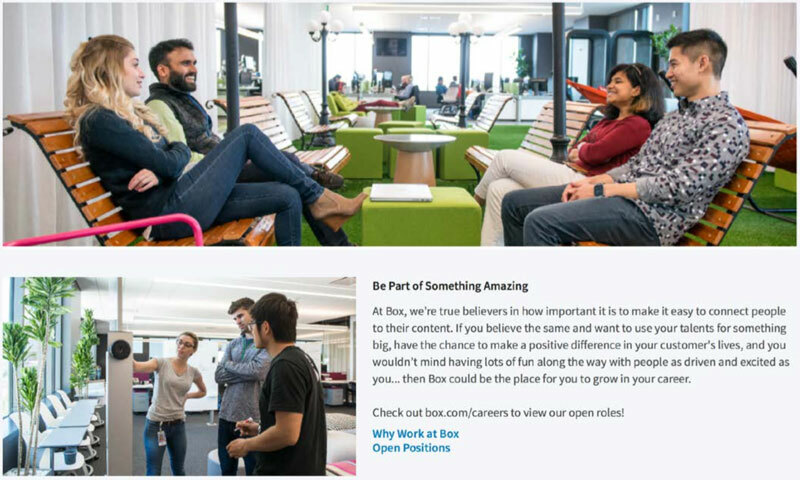 Their LinkedIn Careers Page celebrates both their diverse and fun-loving culture, and the employees who make it possible. Cloud management platform Box is looking for salespeople, and tailor their LinkedIn Careers Page to target them. Their visuals and copy work in sync to deliver a peppy, sales-focused message to potential applicants. Like United Shore, Box also utilize an action-oriented tagline to great effect. “Be part of something amazing,” candidates are told. Affirming and exciting, it concisely entices readers to click the Apply button. BP created a cheerful and informative “Candidate Support” video to remove some of the fear associated with interviewing and walk candidates through the recruitment process. Employing a friendly animation and upbeat music, the video provides tips to help candidates prepare for and excel in the interview, as well as letting them know what they can expect before, during, and after their interview stage. BP’s recruitment video is a useful and encouraging tool to support both applicants at the early stages of their career and those who have not interviewed for some time. By ensuring candidates are better prepared for and more relaxed during interviews, recruiters can use the time more wisely to have more meaningful conversations. 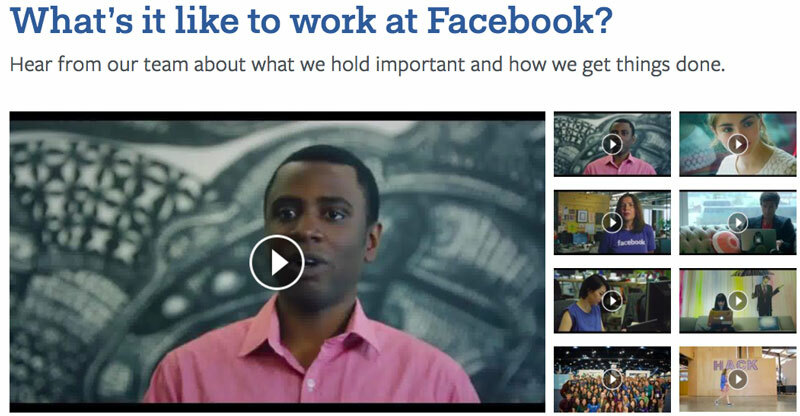 Facebook is proud of their company culture, and showcase it in a series of recruitment videos that target specific candidates for a range of positions. Click here to see videos. By using real employees in their videos, Facebook is able to give potential candidates an authentic glimpse into what their life at the company could be like—including a peek into the sorts of offices they could be working in. 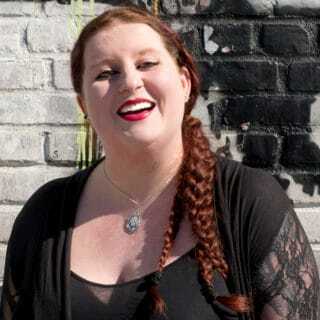 Hubspot’s VP of marketing, Nataly Kelly, likes to keep her InMails short, friendly, and personalized. 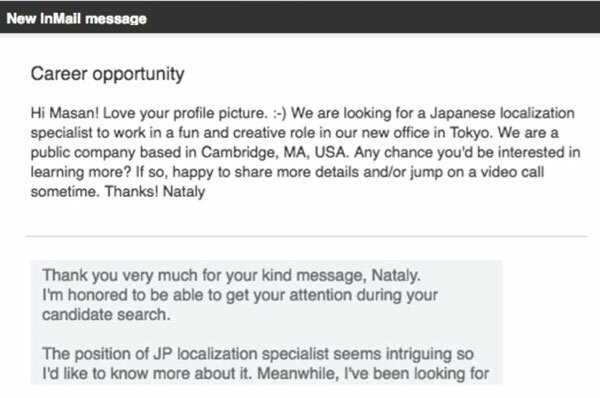 During a search for a localization specialist, she found a great candidate on LinkedIn and sent a quick InMail that sparked a conversation. A comment about the candidate’s profile picture helps forge a personal connection, while the use of an emoji and fun language reflects the company’s culture. Best of all, her InMail ends on a simple call to action to put the ball in the candidate’s court. Social Talent understands the power of the personal approach. Their InMails support their recruitment efforts by ensuring the recipient knows from the outset that they are being treated as an individual—no copy and paste here! Social Talent’s InMails reference articles and social media posts written by the prospective candidate, and seek to forge a personal connection wherever possible. 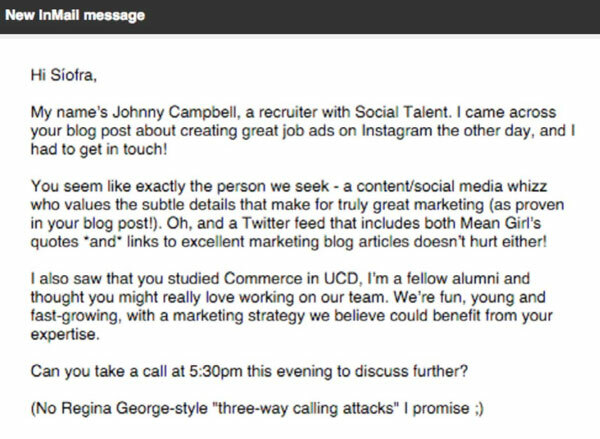 They’re also comfortable using humor and pop culture to make their InMails more memorable—like leveraging a candidate’s references to Mean Girls on Twitter to make a joke about their upcoming call. “No Regina George-style ‘three-way calling attacks’ I promise,” one InMail message jokes. That is so fetch. A little creativity goes a long way. To stand out from the crowd, recruiters need to utilize every tool they have to cultivate and maintain an appealing and memorable employer brand. To see more innovative recruitment marketing examples, download our lookbook.